Lochiel Print is an Ellerslie based, family owned and operated business. We are committed to delivering quality print and superior customer service to all clients, large and small - Auckland wide or anywhere in New Zealand. Lochiel Print has been offering innovative and personalised printing to its customers for over 30 years. From traditional offset printing (up to A1 size and 6 colours) through to the latest in digital printing that offers total flexibility and fast-turnaround, you can depend on a company that stands behind everything it produces. You don't get stuck in rigid production schedules, rather your actual delivery requirements are listened to and followed through on. We specialise in offset, digital print, signage and logistics. Our clients include large corporations requiring print and warehousing to small businesses that need just one print job per year. We will work with you to deliver the quality job you expect – in the timeframe you need! 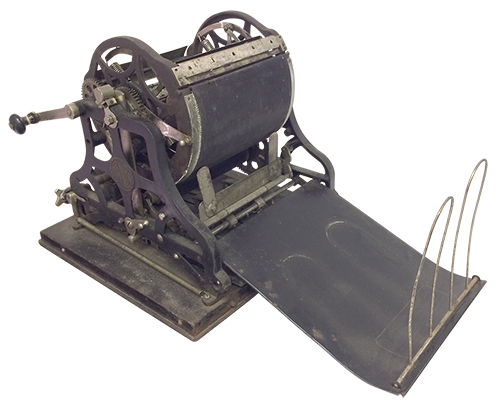 Early manual duplicating machine showing how far the printing industry has come in a century.